Disclaimer: ThredUp gave me a discount coupon to get some my favorite frugal fashion finds in the post. However, I’ve been a ThredUp customer for several years and use them regularly. Also, it’s also part of a challenge where a group of us bloggers wrote about some of our favorite things. Be sure to check the links for that, below! David and I recently went on our “honeymoon.” When we married nine years ago, we blended two families. Four kids and juggling ready-made family schedules didn’t lend well to a newlywed vacation. 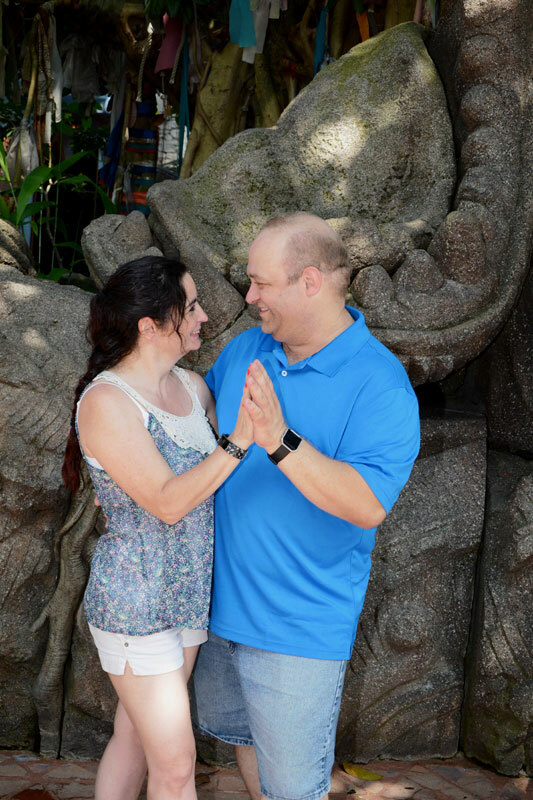 Besides, we flew from Minnesota to Florida so we could get married surrounded by our closest friends and family. After buying six plane tickets, a second trip was really out of the question. Isn’t that the way it frequently goes, though? We were finally able to make that trip – just the two of us – after ten years of being together. 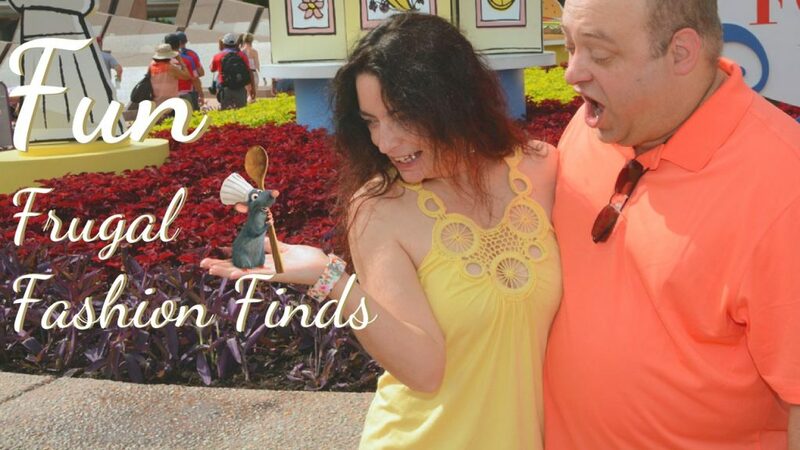 We visited Epcot Food and Wine Festival at Disney World and had a fantastic time! This year marks Epcot’s 35th anniversary, and Disney put out 35 booths from all over the world. We dined. We wined. We got hot and whined some more. Ha! We are Floridians, though, so we can take it. Also, since I am the family shutterbug, I am always behind the camera taking photos. Therefore, very few pictures exist of David and me together. 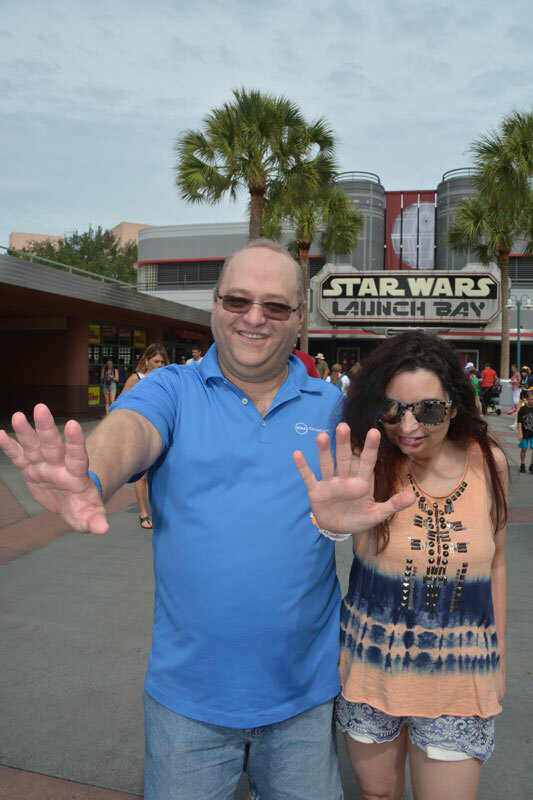 So, he suggested that we invest in Disney’s PhotoPass and that I leave my DSLR behind. *GASP*! My first thought? I want some new clothes so I can look good in our photos – but I didn’t want to trim the vacation budget to do so. Then, I remembered ThredUp. ThredUp is one of my favorite places to shop for clothes. I get designer clothing (like BCBG) for pennies compared to the original price. ThredUp specializes in reselling pre-owned women’s and children’s clothing on a consignment basis. However, everything I’ve ever gotten from them appears brand new. Some of my clothing orders even arrived with tags. ThredUp is always my first recommendation for frugal fashions. Also, if their low prices on high-quality clothes don’t intrigue you, how about a 50% off coupon? Just enter WOMENS50 at checkout to get an unprecedented 50% off your first order (Expires 12/2017). Also, when you sign up, you get $10 credit! Already a ThredUp customer? I got a code for you, as well. Just use WEHEARTYOU20 for 20% off your entire order until May 2018. Also, if you use their app to shop, you get free shipping on any order. I am not sure when that offer expires, but I’ve been taking serious advantage of it. 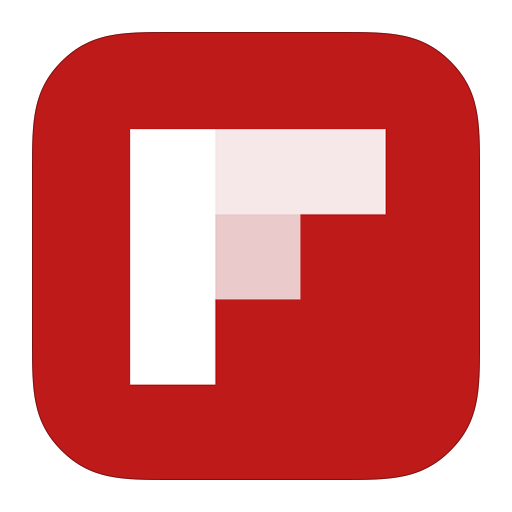 Look in the footer of ThredUp’s site to download it from Google Play or iTunes. Another place I like to find frugal fashion at our local thrift store. The Waterfront mission feeds homeless people in our local area and provides them with temporary shelter. Lastly, check Amazon for cheap clothes. I have seen new garments there for as low as $1. By the way, these clothes would not be nearly as cute without David by my side to make them look good! I got mostly summer clothes since Orlando celebrates summer persistently. However, I’m ready to start checking out some of ThredUp’s women’s fall Boho styles, too. Or, some of these T-shirts to go with my jeans and denim shorts. Hmmm…. My shoe collection is a little barren. Maybe some fall boots? I could use some frugal fashion finds for fall – or maybe even the Christmas holidays! I just love this top! It’s stylish and comfortable. I’m also in love with the embellished details. Honestly, I felt like I was wearing PJ’s all day. Typically, this set would cost over $50. I got it for $17 total. Even in September, Orlando is hot, so I opted for more summery clothing... and Disney shades. 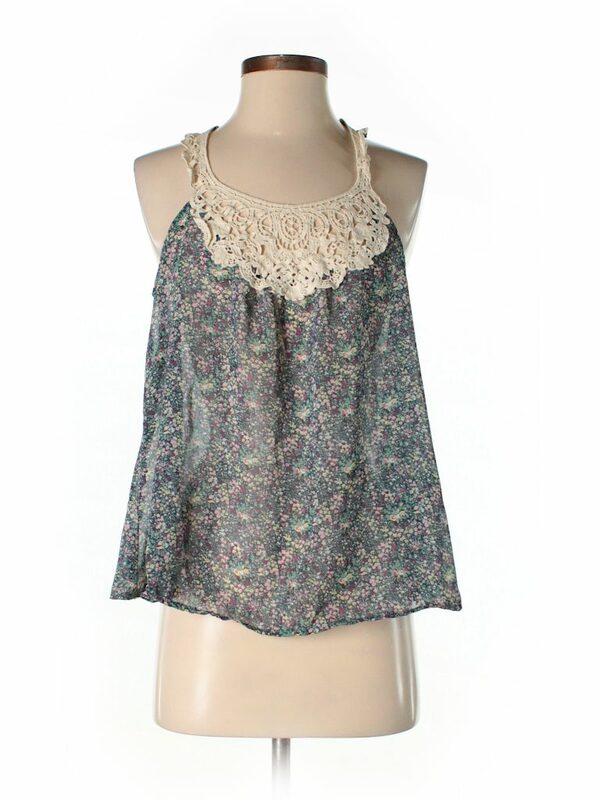 BKE Sleeveless Top with Crochet details. It was practically brand new - and I love the tie-dye accents. 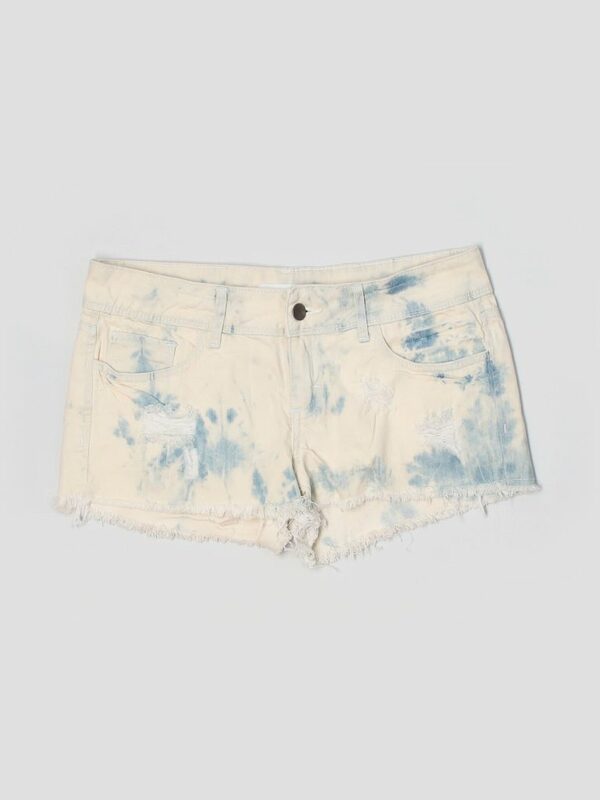 I paired the top with these LA Hearts tie-dye and crochet embellished shorts. 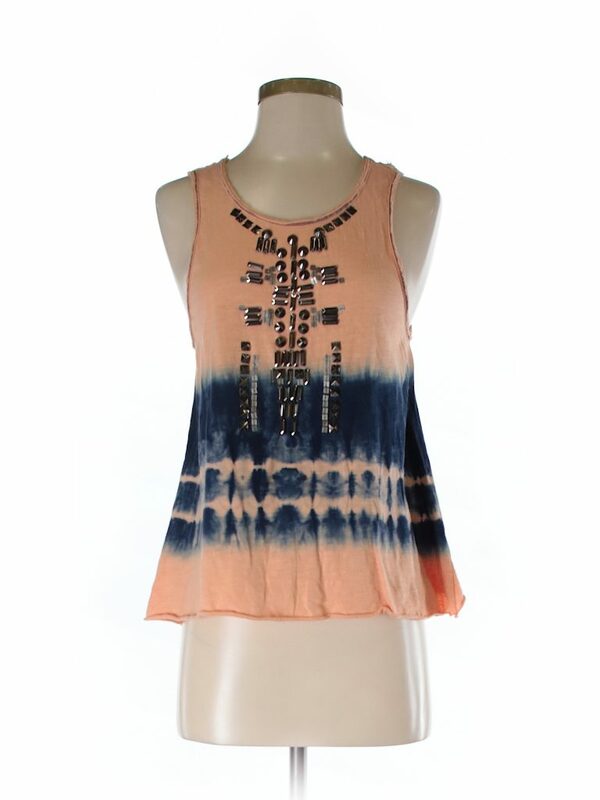 Check out the detailing on this beautiful Boston Proper halter top! The exquisite beadwork draws attention. It usually retails for $48. Since I am short, I frequent Ann Taylor’s Loft line. At $55, these shorts are generally out of my price range, but I got them for $12. I’m also not going to complain about the shoes. I practically stole them at just $7. If you’ve seen my shoe collection, you know I didn’t need any more shoes – but that phrase should be stricken from the English language in my opinion. 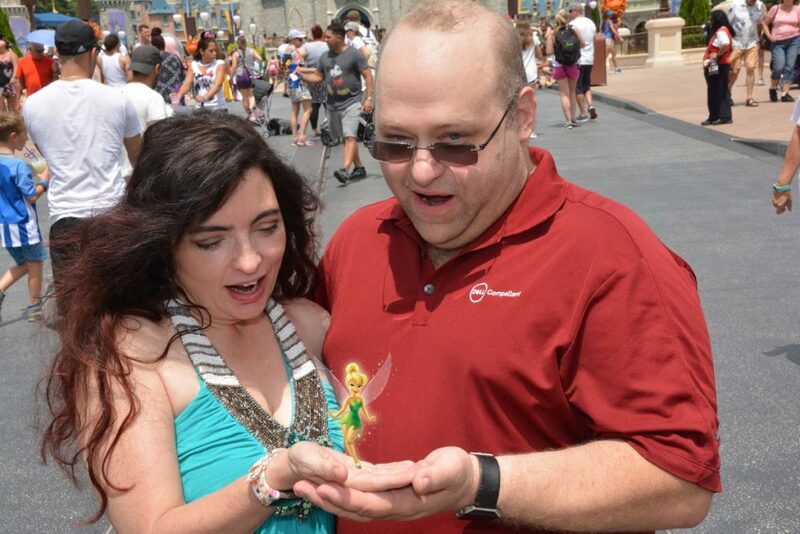 Even Tinkerbell thought this was a magical day! I just love the castle at Magic Kingdom. Boston Proper Halter top with beaded accents and drip dye in teal and dark blue. Y Not? Embellished Strappy Sandals. I actually wore these with several outfits. I wore this Tramp top I got from ThredUp for just $4.99. Now, that’s a great deal! It is sheer, so I layered it over a spaghetti strap top I got on Amazon. I picked up the shorts at the thrift store for about $5. ThredUp has many great fashion tops at great deals. Ok – ignore my walking shoes in the photos below. 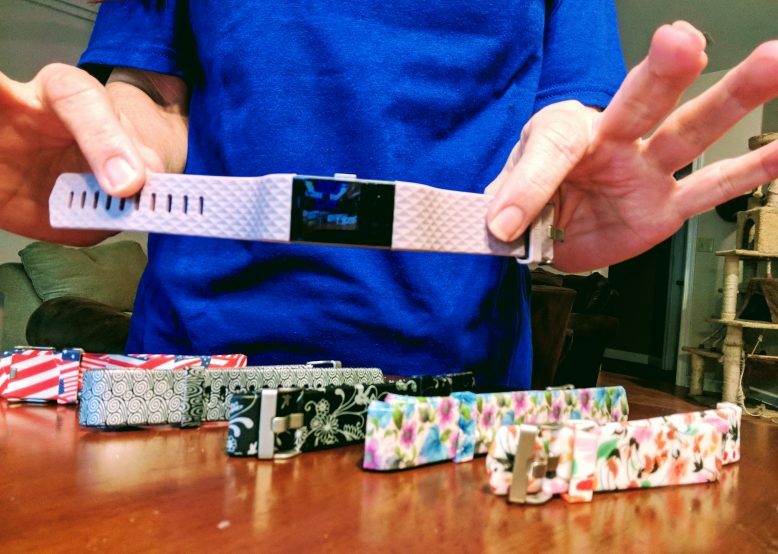 According to Fitbit, I walked over 20,000 steps a day. On our last day, my dogs were barking, and I opted for tennis shoes instead. However, David loves this Max Studios top. I was reluctant to try it because I don’t wear yellow wear usually. Yet, ThredUp has a no-hassle return policy. If I don’t like it, they will give me store credit and even pay for the shipping to return it. But, I ended up loving it – and decided to keep it. The shorts are also keepers. I got the Max Studios top for just $10.99 and paid $4.99 for the 2.1 denim shorts. That’s insane pricing on Max, by the way. Ignore the shoes. This was our last day. According to FitBit, I logged over 20,000 steps a day. By this day, I just wanted my feet to stop hurting. 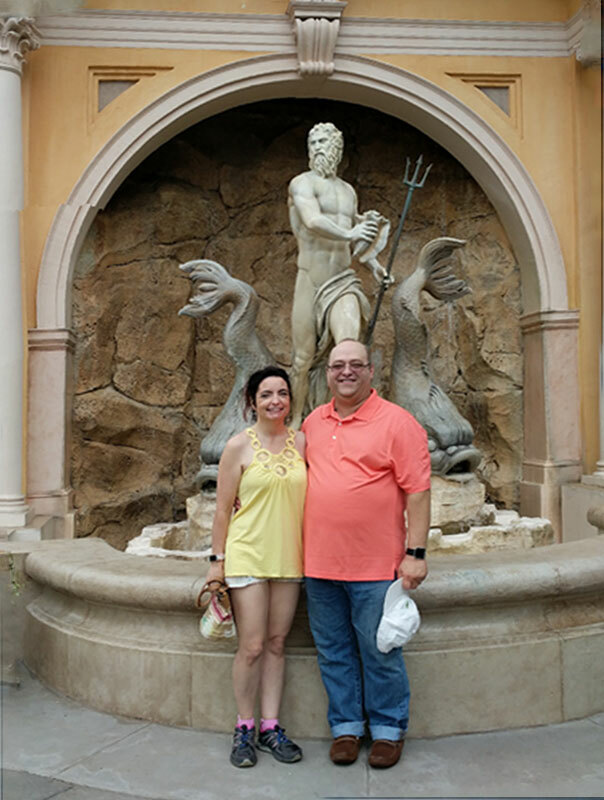 A kind tourist offered to take our photo with my cell phone and I couldn't resist a photo in front of my favorite Disney fountain. 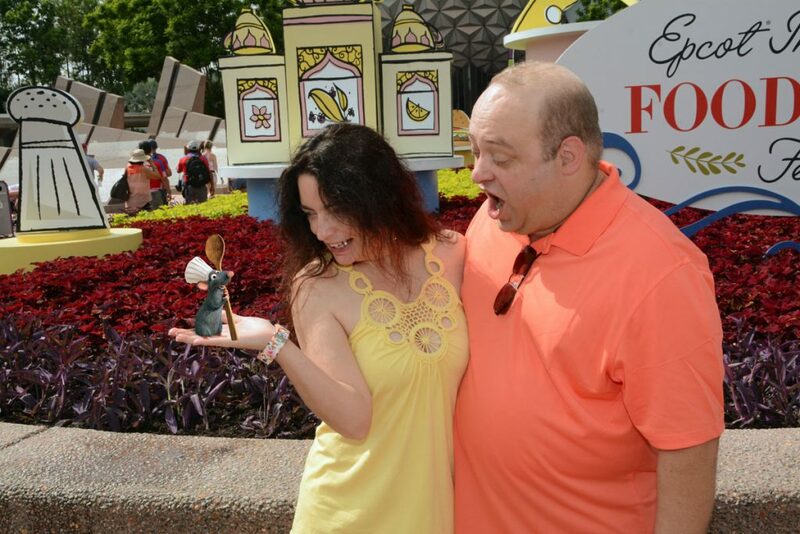 Remy decided to join in on the Epcot Food and Wine Festival Fun. I mean, he's a rat who cooks? How would NOT be there! 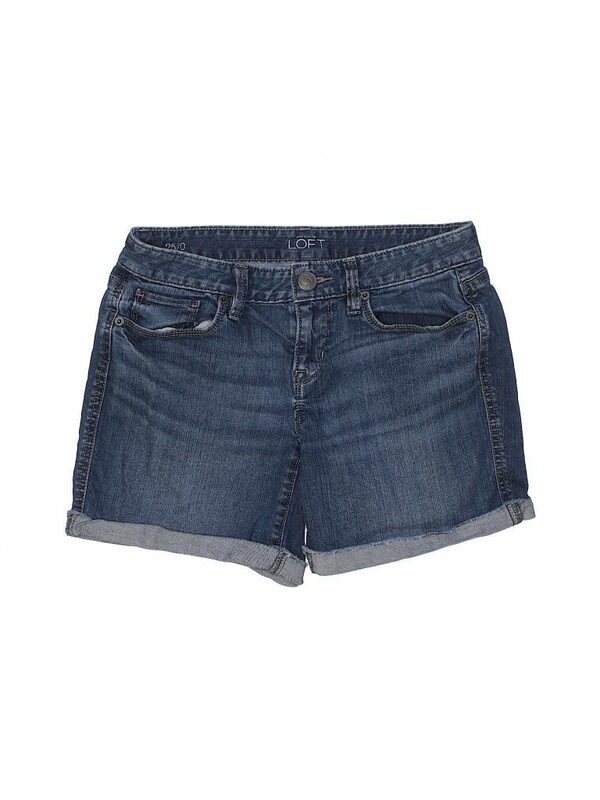 2.1 Denim Shorts with a light blue wash and frayed edges. I love my new frugal fashion finds! I cannot believe I got an entire wardrobe for just $57 before tax! That’s crazy! ThredUp carries women’s sizes from XXS to XXL. They also sell specialty sizes like Maternity, Petites, and Juniors. They just added jewelry to their accessory line and started a high-end Designer category for brands such as Coach and Kate Spade. Be sure to check their children’s clothes, as well. It’s always great to save money! So I loveee the clearance section! You got some great tops at Thread Up – will have to check them out. And living next to Disneyworld, I can vouch that it’s really easy to hit 20,000 steps or more in a day at one of the parks. ThredUp always has cute styles! I love browsing their site for kids clothes because they have amazing deals. These are so cute! I cannot wait to share this with my college age daughter. She loves shopping online for cute clothes, and I love finding great deals. I have been wanting to try this company out. They sound amazing and look like they have great options! You chose some gorgeous options! ThredUp is definitely handy and worth every penny! We shop for deals at our local thrift stores all the time. Looks like ThredUp’s prices rival our local shops – going to have to check them out! They do rival thrift shops pricing – and the clothes are always almost like new. I love these outfits and thank you for the tips. I am always on the lookout for great deals. I love ThredUp! I have been selling used clothes and swapping and buying other clothes. I just got another bag to sell my unworn clothes. They do have great variety selection to shop! Wow. That was a lot of savings! And all the outfits are pretty. Very nice choice, so gorgeous! What cute outfits! I love the combinations you put together. 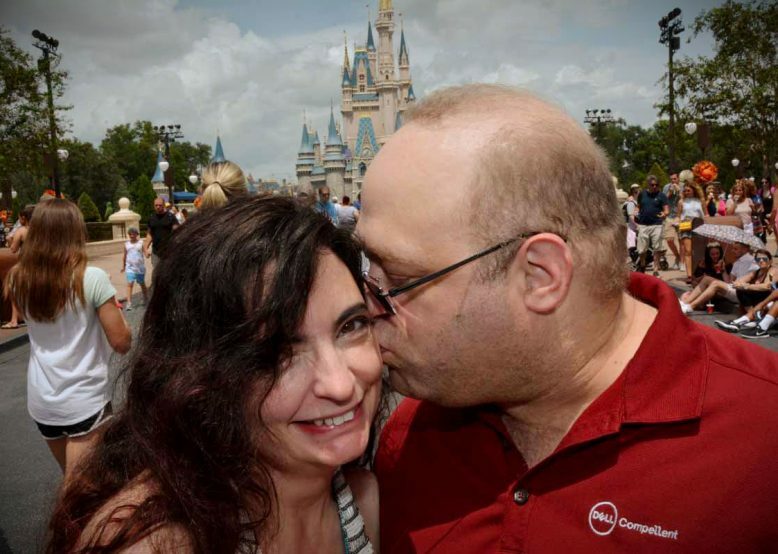 Plus… you made me feel homesick looking at Disney– I grew up in Orlando. I grew up in Florida – and lived in Orlando for a few years. I’ll check out TredUp. I prefer the stores with a good return policy. Me too! I’m so hard to fit (at 4’10), so -especially when buying online – if they don’t have a good return policy, I won’t buy. I really have to look into it now. I definitely like the prices and the clothes look great! Sounds like some great deals! You had me at 50% off… and that outfit looks great on you! My motto is why spend more than you have to. I need to check this place out. I just had a friend mention ThredUp but I hadn’t looked into it yet. Just clicked over and WOW! It may be my new favorite place on the internet. Thanks for the info! It IS my favorite shopping place! So many choices – and an excellent return policy. I have never tried threadup! I have heard tons of great things about their website. I love thrift shopping in and around my town though! I’m always finding some great items. I love the tinkerbell top! It suits you well. I really like the diversity of your wardrobe. All your tops is so gorgeous like you. I really like the first top that you wore. I will have to admit that I haven’t really tried ThreadUp. I know that I would love it, so I really need to try it sometime soon. You found some really great stuff! Those outfits really suit you, I particularly like the shorts. It’s crazy how cheap they are too! You have a gorgeous top that’s fit into you. I really like the most is your first top. You looks so beautiful when you wore it. I love ThredUp! It’s so easy to find cute clothes at great prices. Your trip looks fun and you picked some great outfits! love that yellow shirt! The color is great on you! comfortable yet fashionable too! It is hard to pick a favorite. You look so cute in all of them .. .and your pictures with your hubby are adorable. 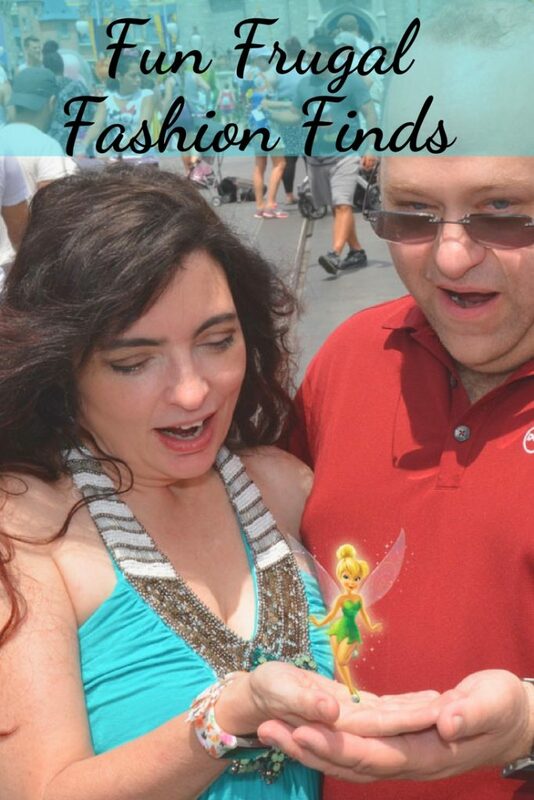 You found some really great pieces and you look great in them too I love the shirt with Tinkerbell. You found some great pieces! I love how you included pics of you wearing everything too! I am glad you really liked their clothes and felt comfortable in them. I have some other friends who really love Thred Up and swear by it! You both look amazing , it is great you are going for this beautiful vacation together. I like the outfits you are wearing, all are so bright and beautiful. The details on your tops are so nice and suits you so well. Thrift shops are my favorite place to shop because you can indeed find brand name clothes and some still have tags on them. ThredUp I have not yet shopped at but will have to with these deals. I love all your outfits and they all look so cute on you too. Thanks for sharing the information and outfits. Oh looks like both of you had a sweet and fun moments there! I really love your outfits, very beautiful. And I’m looking forward to wear one of these soon. I find it difficult to decide here which one to choose as all three has different character and looks quite fabulous especially that intricate work. Aww Alicia. You tow are adorable. That is so sweet. Glad you are getting to enjoy each other despite the load that life bears. I need to check out the online clothing stores. I see some designs that I really like a lot. You got some really great deals and cute clothes! I love shopping at Ross for deals on Betsey Johnson purses. Sometimes, I find cute clothes. I always find great deals on makeup & hair care at Marshalls. BTW, your pictures are really cute! I can’t decide which shirt I like better. The one with Tinkerbell or the yellow one. They are both beautiful!! Wow. You got some really great deals! I think my favorite is the top you chose for Animal Kingdom, but they’ll all cute. Happy Belated Anniversary! I have heard about ThredUp before but never knew just how affordable they were. You got some great pieces. 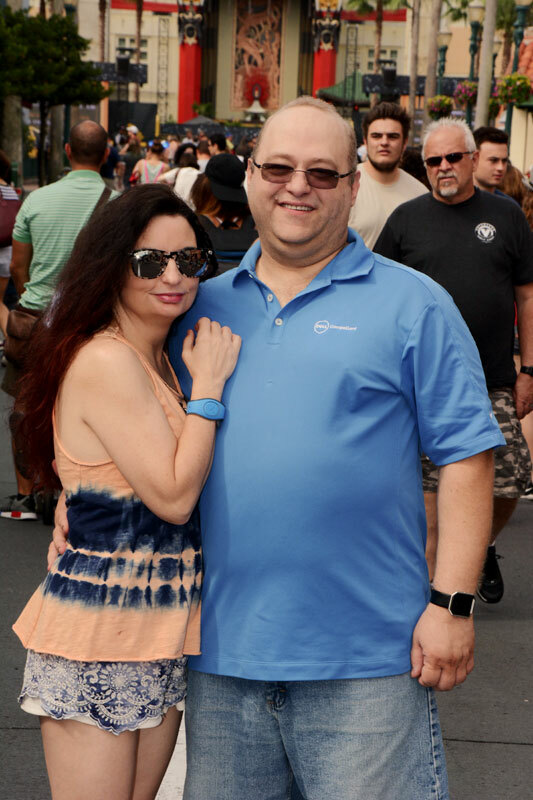 I took my family to Disney for the first in June and we used the Photo Pass too. I am the photographer in our family so it was nice to be in the pictures for once. It was a little unnerving for me to be in the photos. You’d think as a blogger, I would be more comfortable in front of a camera -but I wasn’t. However, we did have fun. And yes – Thred Up is the bomb. Love all the bright and fun colors. 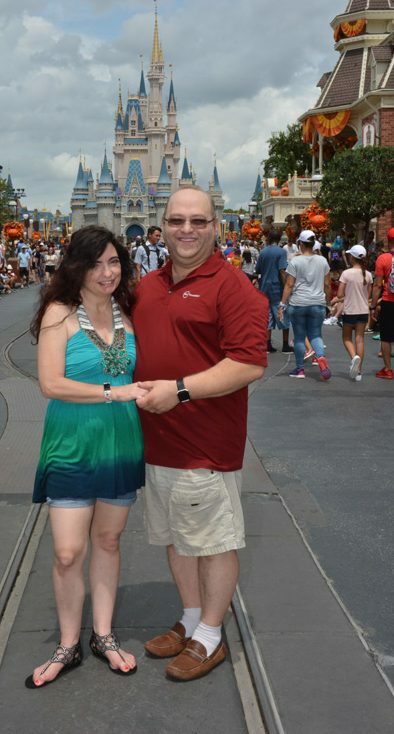 Your outfit matched the fun times at Disney. Love it! I have to check them out! I love all of these outfits, especially that green top! It’s so pretty! Wow I can only imagine what an adjustment it must have been, completely understandable to delay your honeymoon but I am so glad you got to have one, it looks like it was memories that will never be forgotten! You’ve got some amazing bargains, well done! I really love the blue/turquoise top, super pretty! Thanks 🙂 Yep – that was such a comfortable piece! I wear it all the time. And yes – I am glad we delayed it. It gave us time to just enjoy ourselves without worrying about kids. Nuce summery finds. I haven’t heard of many of those websites. Being ill over the past while I haven’t been able to get out and shop in stores as much as I prefer. It’s nice to know how many discount options are out there. I love your outfits. You look like you had lots of fun on your trip. Thanks for sharing. Frugal fashion is seriously what I am all about. It is nice to know that I can have some designer stuff too! Designer clothing is something so many people think that they can not have. These are great ways to be able to snag some! I love all your great outfits you purchased. They look fabulous and looks so nice. I love that sheer shirt you wore to animal kingdom!!! I need it in my wardrobe lol. I’m glad you two were finally able to have that dream honeymoon and spend some quality alone time together! I am, too! We really did need it. I liked that top, too! It’s so light and breezy. It’s always great to know where to find the best deals. You picked out some adorable pieces and scored some really great deals! I think it’s great that you had a honeymoon, even though it was 10 years later! It’s all about enjoying each other with no other distractions around. I love when I get lucky enough to find my favorites in fashion at a great price! What great finds. Super cute photos! I have heard of ThredEup but haven’t tried it myself. My kids consume so much of my budget, but momma needs new clothes! I’ll have to look closer into this! 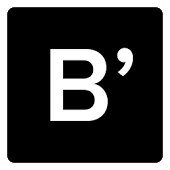 Well, they have awesome kid’s clothes, too – so maybe that will help your budget? i haven’t tried threadup but i have heard of it, it seems like such a perfect way to get decently-priced brand-name clothes. i’ll have to give it a try sometime soon! I had never heard the term of frugal fashion. I am so impressed you got so many things for so cheap! I need to re-learn ho to shop! Sometimes you don’t need to spend much to be fashionable! Great recommendations. Thank you. ThredUp sounds like a fantastic place to shop. With 50% off coupon you can not go wrong. I will have to check them out for a few new pieces to add to my winter wardrobe. I am loving all your outfits what some amazing finds you had and they are all such great value! I would love to make it back to Disney one day. You found some great stuff! I always love a deal. And I love Disney World. I hope to make it back soon. We were there in March and had so much fun. Wow!! You have such a beautiful tops. I really like the 1, 2, and 3 it looks so stylish and beautiful when it wear. These are some really beautiful outfits. I especially those tops. The prices are amazing too. Thanks 🙂 I am going to get me some new fall clothes from them this week. This post had me feeling a little homesick and looking to book a flight into OIA ASAP. Every time I go back home to Orlando, I always make sure to do some shopping. You can truly get some name brands on the low. I took shop at LOFT and always seems to find 40-50% off at the store. I didn’t get these in Orlando. I got them to wear in Orlando. I love shopping there, though. Now, I live in a small town where the most fashionable item is an Alabama Tide or Florida Gators cap. LOL. That’s why I love Thredup. I have options I wouldn’t ordinarily have. I love everything you got! Very trendy and such a great price too. I’ll be sure to check them out. Congrats on the great trip out there. They have a festival like that at the California Adventure park for Disneyland out here. It’s always a lot of fun. But I would love to visit the Epcot one in the near future. I have never been to Disneyland – but I really would love to. Awesome job w/the frugal shopping. Love saving money in ways like this! Those outfits are perfect! I was born and raised in SW Florida, living in SE Texas now, so I am always on the hunt for nicer-looking sleeveless shirts since it’s hot almost year round! I love all of these that you shared! You have a beautiful tops. You look gorgeous to it. What I really want the most is the first one and the 2nd one. Perfect for outfit for summer. Aww! Thanks! Well, they are perfect for summer – but I live in Florida, so I’ll probably wear them year round. Looking sassy and having fun at Walt Disney World, way to go! I have heard of ThreadUp but haven’t been convinced just yet. Ann Taylor Loft is great here in Orlando we have great finds at the outlets too. Yes – I used to love shopping the outlets. We have those same outlets up here in the Panhandle, too. The prices on ThredUp are better than the outlets, most of the time. These are great finds! I love finding designer pieces for a fraction of the price. I do shop our local thrift stores. I have heard of ThredUp but haven’t checked out the selectionary and prices yet. None of these outfits were really my style but you look amazing in them and who does not love a good deal! The wonderful thing about ThredUp is that they have 1000’s of styles to choose from. And thanks! Super cute outfits. I going to have to check out that website to see if there is anything there that I like. These are some great finds! I am so happy to see that more and more people are jumping into the online consigning. I’ve been thrifting since I was a teen and you can find so many great things and awesome outfits! I’ve been thrifting since I was a kid, too – I’m 46 now – and still do it. I’m glad online is an option – and strongly encourage it. How ironic! I’m also married (third time’s the charm!) to a David, and we also never had a honeymoon when we got married about 11 1/2 years ago! We did go to Punta Cana in November 2013 for my middle daughter’s destination wedding, but we would love to go back by ourselves for a proper “honeymoon” without “kids” and family around! You are very welcome! and yes – that is Irony. David is my third husband (not sure I said that in my post, though – if not – more irony.) And yes – you definitely need a honeymoon without family. While your trip sounds like it was probably amazing – it wasn’t focused on you two as a couple. Can you reuse the 20% off code for any and all orders before May 2018? If so, that would be awesome! ThredUp is so fun! I’ve sold with them a few times and love that they reduce our impact on the planet! I’ve never sold with them. How was your experience with that? The outfits are awesome and you guys make a very cute couple! I hope me and my husband can be that in love after 10 years! We didn’t have a honeymoon either, but sometimes that kind of thing can wait! By the way, love those photos with Tinkerbell and Remy, would love to do that! We had an absolute blast – and thank you! We actually dated in high school. He joined the Navy and we both found different relationships. It is refreshing being back together. Every day is new and fresh. We had an awesome time – and thanks! I like the yellow top, too! My birthday is this weekend and I may wear it then. Such cute outfits. I need to check out ThreadUp to see if they carry plus sizes. I love all these looks. I love all these looks, super boho and summery. I think the first look is my favorite. You pull it off well! I’m a sucker for Boho, but usually restrict it to fall. I do love summer clothes almost year round, though! It is so important to shop around and find deals so as not to pay full price. Great money saving tips. I think it is awesome you share sales and codes with people to help them find the deals. It’s awesome that you were able to find so many cute outfits for such good prices. I could probably use a wardrobe update! These are all great looks on you and wow! what a deal! I’ve heard of Thread Up, but have been nervous to try it. I am loving all of these looks! The colors are amazing and right up my alley. They look so good on you! It’s October and I think I should buy everything you just showed because it’s a freaking sauna in Morocco; You would seriously think it’s still summer. I live in Florida and it’s hot and humid here year-round. However, I’m pretty sure Morrocco has us beat! That is a lot of clothing for that amount of money. I love them all and they all look great on you. What a great find. I will have to try ThreadUp out. aw you guys are too cute! I’m always on the hunt for affordable clothing! these are some great options! Great outfit choices!! They all look so comfy! I especially like the blue top. I love the Boston Proper halter top! Its looks great on you and cant beat the price. Great finds. I love love love these outfits! They look cool and comfortable yet fashionable too! You are right about Orlando celebrating summer persistently! I live an hour and a half from there and it is certainly hot! Your clothes are so cute….I love Thred Up also! Congratulations on celebrating your honeymoon. Looks like you had fun!! Thank you for joining in our blog hop!! I like the yellow top the best. The color is great on you! So cute. I love that yellow shirt!